Apple’s WWDC may be causing a stir in San Francisco, but that hasn’t stopped the Cupertino company from pursuing additional product sales through marketing. This year’s WWDC keynote speech introduced us all to the Health app and HealthKit framework that was speculated on so much in the last few months. 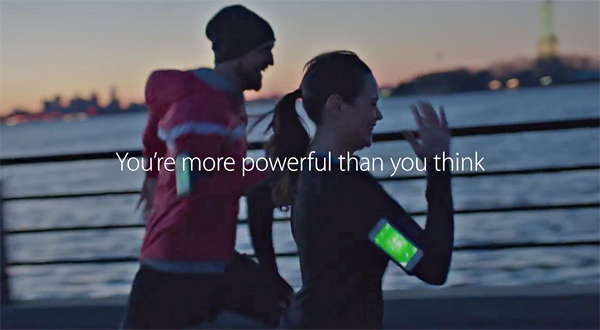 In an attempt to keep attention on the health and fitness aspect of the iPhone 5s and iOS, Apple’s new “Strength” TV ad focuses on a selection of the multiple third-party fitness accessories that are available for consumers to purchase. The latest commercial to officially promote Apple’s products and services is clearly the one that has been designed to have a maximum impact on its target audience by using the hype and media attention that currently surrounds its recent WWDC based announcements. The commercial itself is approximately one-minute in length and debuted to an extremely large audience during the first period of The Stanley Cup finals. Taking a slot out on national television during a major sporting event pretty much guarantees that Apple can get the message across to a captive audience. The TV ad is extremely similar to a number of other recent Apple commercials, in that it follows a similar pattern of attempting to invoke viewer reaction through the use of emotive videography and backing music. The soundtrack in this instance is a song by Robert Preston called “Chicken Fat” and plays over the top of iPhone 5s owners’ enthusiastic interaction with fitness accessories such as the Zepp Golf Sensor and the Wahoo Bike Sensor. There’s also a selection of third-party health and fitness based apps on display during the 60-second slot. The tone and overall content of the commercial seems to mimic the extremely upbeat and fresh attitude that was displayed by Apple’s executive team during Monday’s WWDC keynote. You really get a sense that the fruit company is not only happy with its current position but also extremely positive about the future roadmap that has been marked out internally. The announcement of Health and HealthKit this week mixed together with this advertising campaign and the continued speculation about the mysterious “iWatch” would suggest that fitness and well-being are set to play an integral role in Apple’s immediate future.